Most developers have vast degrees of technical knowledge but what they lack is creativity, a deep conceptual understanding of marketing and copy writing and the ability to capture the essence of a client's business. Thraco Media's staff hail from all over the entertainment, design and legal industries. We have no hidden costs. Require no deposit or retainer and most of our sites go live in 10 days or less. Don't take our word for it, insist on talking to one of our many happy clients! So don't waste your time getting lost in a website mill company. Let us take care of you, get your site done once the right way and create something for you that you can update yourself after some short personalized tutorials from us! 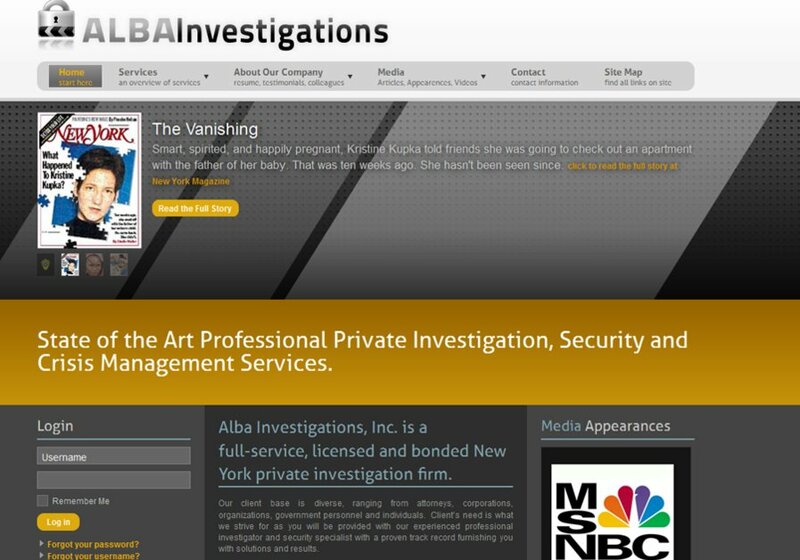 Screenshot from Alba Investigations, one of the top Private Investigations Firm in the United States. Our client frequently appears on national television.